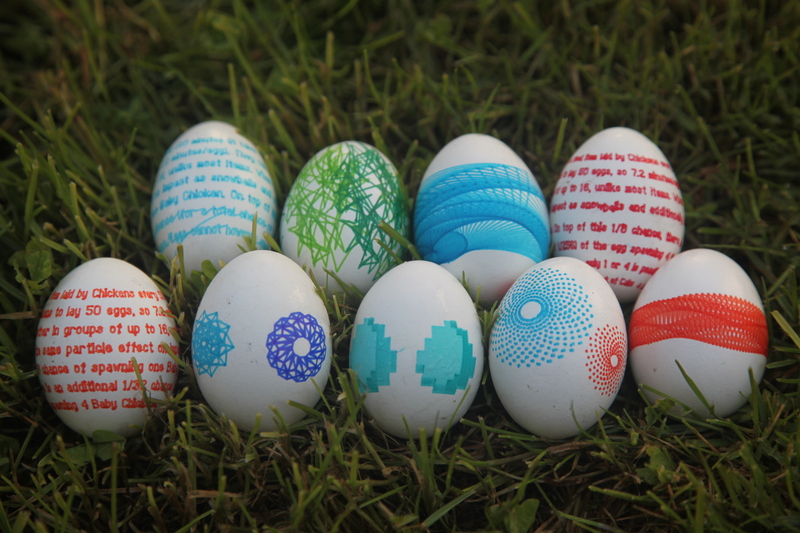 This year’s eggs were designed using Nodebox and Inkscape. Charlie worked mostly in Nodebox. It’s patch-based programming was right at his level and copy, rotate and wiggle all got a lot of action. Wyatt found inspiration in Minecraft and we worked together to write a letter writing script in Python to print out an wiki entry on egg. Then he created a vector version of the pixelated egg in Inkscape. The video below shows some highlights from production. This entry was posted in projects and tagged Eggbot. Bookmark the permalink. Will any of the designs be made available to download? Bill, a few of these designs are inkscape drawings and others are draw using processing. I will try to post both types over the next few weeks. Very nice. I was hoping for SVGs but the processing sketches as well a great. Thanks. Check the SVG folder. Most of the eggs on this page should be included there.